Thallus: foliose, approximately circular in outline, large, 5-30 cm in diam. 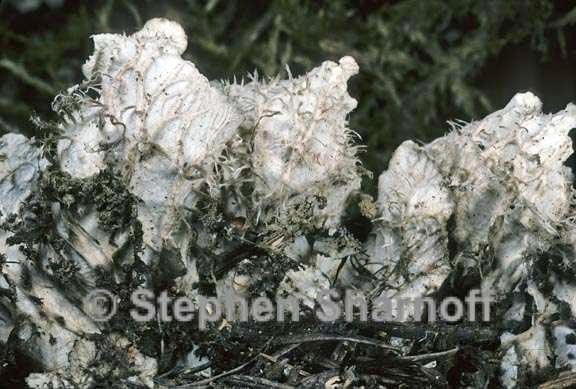 lobes: +flattened and elongate (up to 3 cm wide and up to 5 cm long), imbricate or separate; tips: rounded to subtruncate, often ascending upper surface: gray, or white to bluish gray when dry, blackish green when wet, smooth, dull, thin to thickly white-gray tomentose, often glabrescent and reddish brown towards center, without isidia or soredia but marginally (and along thallus cracks) phyllidiate phyllidia: scattered to dense, corticate, warty to squamulose, 0.3-1.5 mm wide medulla: white, +loosely interwoven hyphae photobiont: Nostoc lower surface: white, with anastomosing pale to medium brown, smooth, flattened veins, rhizinate rhizines: white to brown, irregular, simple or with short lateral branches or remaining downy Apothecia: frequent, +round to oblong, saddle-shaped, marginal, up to 7 mm in diam. disc: flat, red-brown to brown, smooth ascospores: colorless, acicular, 3-5 septate, 30-60 x 3-6 µm Pycnidia: not seen Spot tests: all negative Secondary metabolites: none detected. Substrate and ecology: among mosses over rock (and soil?) or bark World distribution: temperate and boreal regions of North America, Europe and Asia Sonoran distribution: Arizona, southern California, Baja California Sur, and Chihuahua. Notes: The presence of marginal and laminal phyllidia, as well as its slender, scattered and little-branched rhizines characterize P. praetextata, but these chareacters are to a great extent modifiable, so that the distinction with other species, for example P. fibrilloides, may be difficult to interpret. Also, thalli lacking phyllidia, especially when young, may be problematic to identify.